The East-West Line (EWL) was hit with a 40-minute delay due to a track point fault at Clementi MRT Station at about 7am on Wednesday (Sep 19). 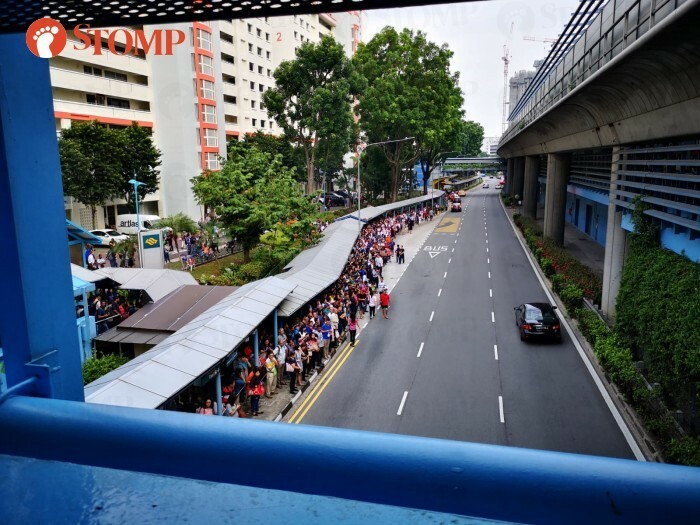 Several Stompers who alerted Stomp to the incident mentioned having to wait for a long time while being told that a track fault was being rectified. "I went to Jurong East MRT at 7am this morning," said Stomper Mark in a phone interview. "I have been waiting for the train for half an hour." "Apparently there was a fault with the track which had to be rectified. "The staff also announced that there would be no charge for commuters tapping out." Mark sent Stomp a video taken at Jurong East MRT Station, showing the platform filled with a crowd of commuters. In the video, an announcement can be heard over the public announcement system informing commuters that if they choose to tap out, they will not be charged. Stomper Jeff, who boarded a stationary train at Tanah Merah MRT Station at about 7.10am, had to wait in the carriage for around 40 minutes before the train started moving. "When I went up the escalator, I saw the door of the train open so I doubled up my step," Jeff said to Stomp over the phone. "I thought it was my lucky day. "However, when I boarded the train, I noted something was wrong as the train was not moving. "I ended up waiting from 7.10am to 7.47am. "All the other tracks have stopped and none of the trains are moving. "The other passengers including me were confused and did not know what was going on. "Eventually, we were told by the staff that there was a track fault at Clementi." In a video he shared with us, the other trains at Tanah Merah MRT Station are seen to be stationary too. 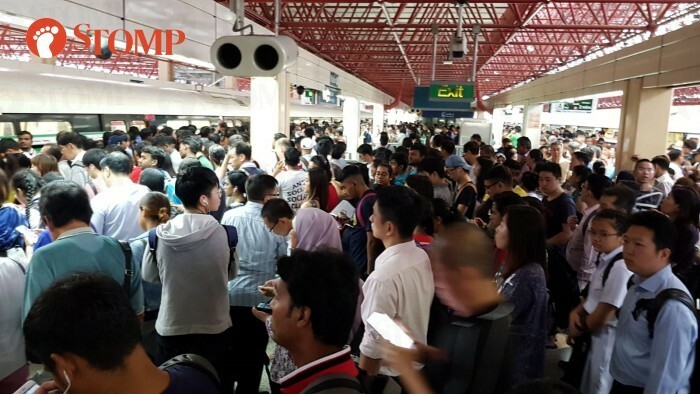 Stomper Kannan also shared with Stomp some photos of the situation this morning at Queenstown MRT Station. A huge crowd of commuters can be seen gathering at the bus stop. It is unclear as to what time he took the photos. The delay affected train services between Jurong East and Clementi, Singapore Mass Rapid Transit (SMRT) said in a tweet at 7.10am. [EWL]: Due to a track point fault at #Clementi, train service btwn #JurongEast and #Clementi will be delayed for 30mins. Free regular bus service is available between #JurongEast and #Queenstown. SMRT also said in a Facebook post that train services between Clementi and Jurong East MRT Station had to be stopped so that the track fault could be rectified by staff. "Train services have progressively resumed," said the caption on the Facebook post. "Due to slow train movements, please cater for additional 40 minutes of train travel time. "We are sorry your morning commute has been affected." SERVICE UPDATE: Passengers who are travelling to the city, please be advised to take the North South Line via #Woodlands, #AngMoKio and #Orchard. SMRT also advised passengers travelling to the city to avoid the EWL and take the North-South Line (NSL) via Woodlands, Ang Mo Kio and Orchard instead in a separate tweet. "I've been stuck in the train for quite long," said Ms June Lim to The Straits Times. "It took me 45 minutes just to get to Clementi from Boon Lay, when usually it would take just 10 minutes. "It was so humid that I felt faint and had to come out to sit down for a while. "I'm actually on the way to work at Farrer Park and I'm not late yet because I left home early. "But I'll most likely be late at this rate." According to The Straits Times, this incident happened a day after the EWL was hit with a 15 minute delay due to a platform screen door fault. The last time a major delay was reported, it happened along the westbound stretch of the EWL in April, which lasted almost three hours. That delay was also attributed to a track fault by SMRT, and commuters were advised to add 25 minutes to their journey.